The visible perfection of a diamond goes well beyond what you can see with just your eyes, it lays within the perfection which is visible through various gemological tools which are designed to provide specific insight into the hidden factors which contribute to the sparkle factor of a diamond. While it might seem like consumers are able to judge the relative visual performance of a diamond in a traditional brick and mortar jewelry store environment, the reality is that jewelry store lighting is specially designed to make diamonds “pop” regardless of their actual cut quality. Special lighting and dichromatic blue filters are used at great expense to make diamonds look their best and this type of lighting is completely different than the lighting environments that the diamond will actually be worn and viewed in. Thus the ability to view diamonds in-person in an in-store environment provides consumers with a false sense of security. Likewise, it is practically impossible for people to determine the sparkle factor of a diamond online due to variations in monitor calibration, screen resolution, and non-existent standards for diamond photography and online presentation platforms. While there are some pretty cool imaging systems which enable us to provide you with insight into the clarity characteristics and visual perfection of a diamond and there are many different methods of displaying diamonds online to show the sparkle of the diamond, the reality of course is that there is no consistency to be found from online dealer to dealer. You don’t have to look far to prove this theory, simply compare two seemingly identical diamonds being offered by any online dealer and you’ll notice that there is a visible difference to be seen between the diamonds even when factors such as carat weight, color, clarity and proportions are identical. Differences as subtle as the time of day during which a diamond is photographed can have a substantial effect upon the perceived visual performance, as demonstrated by photographs and video footage. Due to the competitive nature of the online diamond business, it is possible for “real people” to evaluate diamonds in the same manner that professional diamond buyers select diamonds for inventory. Diamond grading tools and techniques which were considered to be “top secret” and coveted by industry professionals only a few years ago, have become common place information on web sites such as Brian Gavin Diamonds. Tools and technology which were originally only known to diamond cutters, is now used throughout the industry and has become part of the online world of diamonds; interestingly enough the majority of brick and mortar jewelry stores have yet to embrace the advancement of technology which is readily available to them and seem to prefer to keep their customers in the dark, in relatively well lit showrooms. The modern diamond buyer has access to state-of-the-art gemological data provided not only by independent gemological laboratories, but which is made readily available on the diamond details pages of Brian Gavin Diamonds. And this technology provides easy to understand insight into the perfection of diamond cut quality which results in maximum visual performance or which most people refer to as sparkle. While it is not necessary for you to understand all of the technical details about how each piece of equipment work, it is nice to understand what the different tools are intended to demonstrate and what to look for within each scope image. 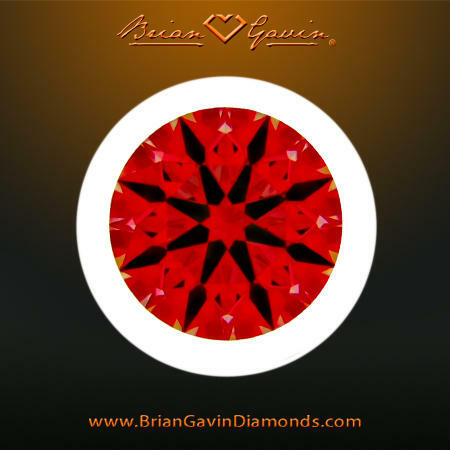 The color red represents light which is striking the diamond from 45° up to perpendicular with the table facet, this is the brightest light which makes the diamond brilliant. The color green represents light which is not as bright, it strikes the diamond from 45° out to the horizon, however note that it is completely normal for the center region of the table facet to be red, green or a combination thereof because they share the 45° factor. The color blue represents contrast which is what enables our eyes to see, this is light which could have entered the diamond, but which is being blocked by our heads (or a camera lens) as we observe the diamond. 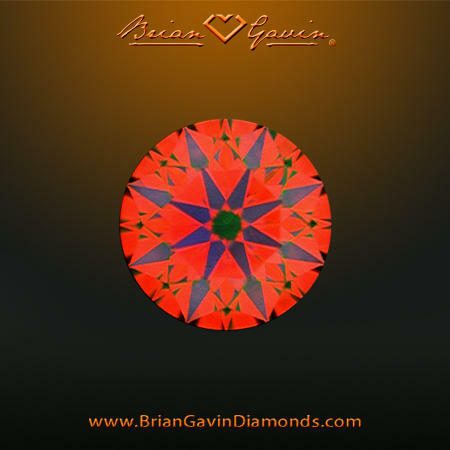 The eight pointed star pattern which is visible in this photograph of a Brian Gavin Signature Hearts and Arrows Diamond is a reflection of the eight pavilion main facets which are part of the lower half of the diamond. Black and White represents leakage which is present in all diamonds to some extent, whether the leakage appears as black or white depends on the lighting environment being used. The fastest way to determine whether a round brilliant ideal cut diamond is going to exhibit maximum visual performance and “sparkle factor” is to look for a crisp and complete pattern of hearts and arrows. Combined with proportions within the center region of the range specified for the AGS Ideal 0 cut rating, a hearts and arrows pattern is a clear indication that the diamond will exhibit a higher number of virtual facets and will produce larger flashes of brilliance and dispersion with a superior amount of scintillation. We’re not going to get into the intricacies of how this pattern of eight hearts and the V’s beneath them are formed in this tutorial, but will do so in a separate tutorial which will explain “How Hearts and Arrows Diamonds are Cut” and “Grading of Hearts and Arrows Diamonds”. For the purpose of this article, you just need to know that the presence of a crisp and complete pattern of Hearts and Arrows as is visible in the hearts image (left) and the ASET image provided previously is an indication that the diamond has been cut to precise standards which are well beyond the cut quality of the average round brilliant ideal cut diamond. Diamonds which exhibit this precise pattern of hearts and arrows will exhibit a greater amount of contrast and scintillation (sparkle) than diamonds which do not exhibit this pattern. The reason why most diamond dealers do not make these images readily available to their customers is because to do so would show the shortcomings of their production quickly and easily. 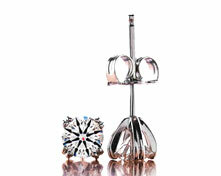 Practically all diamonds will look good when viewed under traditional jewelry store lighting, but the fact of the matter is that most diamonds lose a significant amount of sparkle when viewed in normal lighting environments because they have been cut for maximum retention of carat weight and not visual performance. 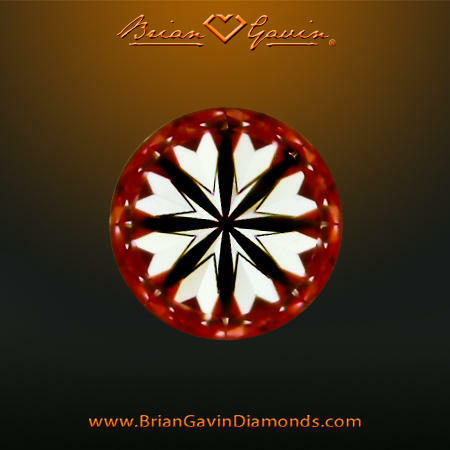 Brian Gavin Signature Hearts and Arrows Diamonds and the diamonds within our Brian Gavin Blue collection have been carefully cut to maximize their light return and optical properties and we prove it by providing you with an image of the diamond as seen through an Ideal Scope. The Ideal Scope was designed by Gemologist Garry Holloway and is based upon research conducted by a Japanese scientist named Okuda, who in the 1970’s developed a way to study diamond cut quality and light performance by filtering the light using colored filament and 3x magnification to examine the diamond for light leakage. The Ideal Scope is a handheld device which is used by positioning the girdle edge of the diamond so that it is flush with the bottom of the tube and illuminating the diamond from the back with white light, the tube is filtered with a pink plastic cone which acts as a reflector, light which is being properly reflected through the diamond shows up as reddish-pink and light which is leaking shows as white while light which is being blocked by the observer’s head (or camera lens in this instance) appears as black. If all of this seems a bit familiar, it might help to realize that the ASET Scope referenced earlier is an adaptation of the design which is based upon Okuda’s research. At Brian Gavin Diamonds, we pride ourselves on providing our customers with the tools and knowledge necessary for them to make an intelligent and informed decision. 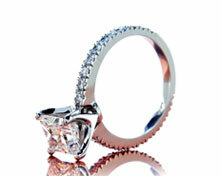 At a time when most of our “competitors” are opting to compete with traditional brick and mortar jewelry stores on price alone and incorrectly leading their customers to believe that diamonds are merely a commodity, we prefer to compete on the additional platforms of Light Performance, Diamond Cut Quality and the Visual Performance or “sparkle factor” which results from producing diamonds to the highest standard of cutting. We provide detailed analysis of the diamonds which we offer because we know that doing so separates our diamonds from the myriad of lab graded diamonds which compete solely on the 4C’s of Diamond Grading (cut, color, clarity, carat weight) by making it possible for our customers to verify the diamond cut quality by using the very same technology which is used in diamond cutting factories and the diamond buying rooms of top tier jewelers all over the world.